I have an idea for a fabulous new segment here on greentea.tk - you guys send me stuff in the mail and I post excitedly about opening up what you've sent. It'll be fun for all! Especially for me. 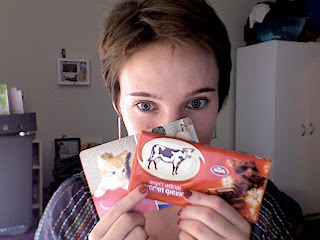 Thank you, Sophie, for the Israeli chocolate and kitten card. The treat will get me through Monday afternoon at my desk. I think it's a great idea. It would require, however, your mailing address. Send over your details and I'll drop something in the mail ASAP! Yay, glad you liked it! Amazing concept, right? Anonymous 2 - I was kidding when I posted this, actually. Chill! Gimme Gimme never gets, don't ya know your manners yet? I actually have a pile of things here that I've been meaning to send you. Thanks for reminding me to get on that. P.S. Sorry about the two anonymous douchebags. 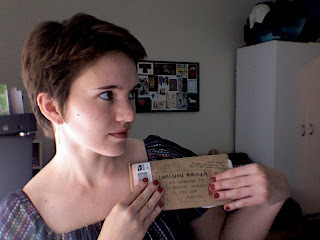 You know, I was serious about sending you something...I just need a mailing address.